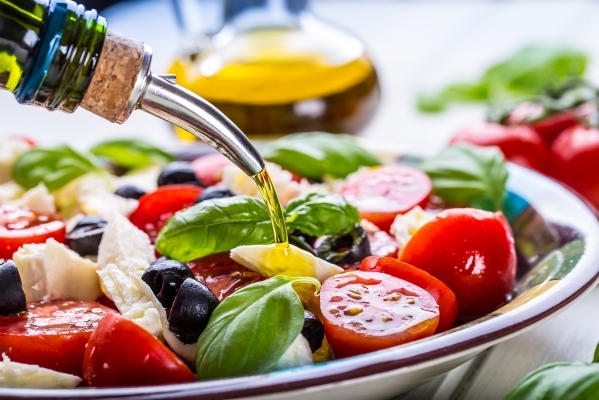 What differentiates the Mediterranean diet from other diet plans? Consuming nutritious foods as well as healthy lifestyle choices are taken into account. Having meals with family and friends, eating healthy foods, and developing an exercise plan are highly encouraged. The Mediterranean diet introduces a holistic approach to dieting for optimal wellness and wellbeing. Healthy fats like olive oil, canola oil, and nuts are used instead of butter and saturated fats. Fish and poultry are main sources of protein, while red meats are consumed less frequently (often once a month). Also, herbs and spices are used for seasoning in place of salt and food additives. Low-fat dairy foods are encouraged (in smaller portions) over fatty dairy products. Although wine is distinctive to the Mediterranean diet it is optional and recommended in moderation. The Mayo Clinic recommends no more than 5 oz. of wine a day for women (or men over 65 years of age) and no more than 10 oz. for men under 65 years of age. Before initiating or changing your diet consult with your physician to determine which diet plan is most suitable for your health needs. Your physician and nutritionist can assist in developing a meal plan that supports your individual health and accommodates lifestyle preferences.